Philadelphia City Councilman Kenyatta Johnson (D-2nd) has reportedly introduced legislation to place a one-year moratorium on construction at the Broad Street and Washington Avenue site where Tower Investments CEO Bart Blatstein has proposed his shapeshifting mixed-use megaproject. According to Plan Philly, Johnson opted to move forward with the bill after hearing from critics of the proposed 32-story tower who believe it will be a "wall" between South Philadelphia and Center City, congesting the area without adding much value either commercially or aesthetically. “The community is unanimously opposed so we want more time for the community to have some level of input before any decisions are made on moving forward on the project,” said Johnson, citing the tower’s height and the perceived dearth of parking for the neighborly opprobrium. Last month, Blatstein presented minor tweaks to the project during a brief meeting with the Civic Design Review Board, which said the proposal's "superblock" orientation was problematic from a utility and navigation standpoint. Originally, Blatstein called for two towers with a combined 1,600 apartments. He later revised it in February to a single tower with a fourth-floor rooftop "Village" containing retail boutiques and dining establishments. Other slight adjustments have since been made in response to CDR and community feedback. 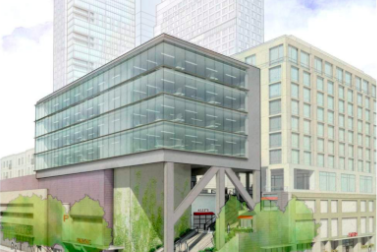 Johnson's bill comes days after the Zoning Board of Approval first granted and then suddenly revoked a variance that would have enabled Blatstein to construct an above-ground parking garage. Last year, Johnson's bill to advance Blatstein's original proposal was held from a vote because of community resistance. Even as Blatstein's development faces an uncertain future, another mixed-use project on the opposite corner of the intersection appears to have much more life. Alterra Property Group and MIS Capital's Lincoln Square proposal an eight-story complex with 356 apartments and 74,000 feet of retail space, including a supermarket and a public walkway, has so far received more favorable impressions from neighbors. Blatstein has otherwise remained active in Philadelphia and South Jersey. Last year, he purchased Atlantic City's shuttered Showboat Casino and opened up the Playground entertainment center at the Pier Shops at Caesars. In Philadelphia, he recently partnered with Cescaphe Event Group to pursue a conversion of the former PECO Delaware Station into a hotel and event space in Fishtown.